I found my first Monarch butterfly caterpillars on the milkweed growing in the container garden! Counted three Monday morning as I was watering the plants. Haven't seen many butterflies, but they are apparently making the rounds, as the three cats can attest to. Man, those little buggers grow fast! Submitted the container butterfly garden site to the Monarch Joint Venture Program. They have a Map of Success Stories featuring sites submitted throughout the U.S. Registered the garden with the Monarch Watch Waystation Program. 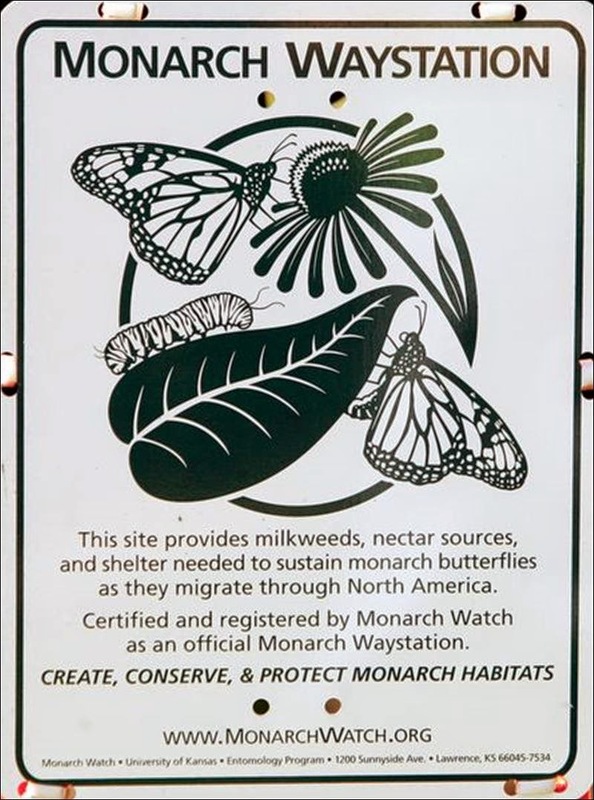 Those of you who are familiar with the Alta Laguna Park Butterfly Garden may remember it was registered with them and received a green and white waystation sign. I should be receiving my sign soon. Update: One cat got lost, one slinked away to turn into a chrysalis methinks, and the third is about half grown and growing bigger every day.